American capitalism is broken, and in the race to fix it there is a lot of prognosticating about what will work, what won’t, and what things will look like after this crisis passes. One of the best things I’ve read in the latter category is Richard Florida’s article, “How the Crash Will Reshape America,” in the March 2009 issue of The Atlantic Monthly. It’s a very long, in-depth analysis and rewards a full, careful reading; but since I suspect you’re not going to do that, let me sum up. Most of the article argues that industrial centers like Detroit are doomed in the long run, and that population-dense areas with diverse economies, like New York, will thrive, based on a notion of the “velocity of ideas” that such places generate, which may sound a little vague but rings true for me. The article holds up Pittsburgh as a model for successfully managing the transition from a large industrial economy to a smaller idea-based one, and it wraps up with some prescriptions for managing this crisis to a comparatively soft landing. The most compelling suggestion the author makes is for “the removal of homeownership from its long-privileged place at the center of the U.S. economy.” Its benefits aside, homeownership creates economic ills of various kinds: for example, it anchors people to a region that may be in economic decline, producing a “creeping rigidity in the labor market,” when those people ought to be mobile and able to go where the work is. Further, government incentives encouraging homeownership distort demand, producing, for example, speculative bubbles of the kind we’ve just seen pop. Richard Florida would rather see government policies favoring property rental, and calls the current tidal wave of foreclosures an opportunity: banks could be required to rent a foreclosed home to the erstwhile owners at the prevailing market rate (typically much less than a mortgage payment). This would achieve the goal of keeping families from ending up on the street, in a less artificial way than prohibiting foreclosures would. Just as importantly, it provides a basis for valuing some of those “toxic assets” you’ve heard so much about. Digression: a big part of the problem in the financial world right now is that years of bad lending decisions have led banks to accumulate a lot of worthless assets on their books — worthless in the literal market sense that no one, no one wants to buy them at any price. In the absence of at least a potential buyer, it is literally impossible to compute a value for an asset, and in the absence of some way to place a value on those assets, banks will sooner or later be forced to “write them down” — to admit they’re worthless and that the bank as a whole is worth a lot less than before. If the bank’s assets shrink enough, its liabilities may overwhelm it, at which point it becomes insolvent. This is one reason why compelling banks to turn foreclosed homes into rental properties is so attractive: in many cases it guarantees a stream of rental income from the property, meaning that the property now has a non-zero value even in a glutted real-estate market where the house itself can’t be sold. I am a somewhat reluctant homeowner. Having grown up in New York City, renting was always the norm, and I never felt the urge to own my own home. But after a few sour landlord-tenant episodes, and after we made some money in the dot-com boom, and after our first son was born, Andrea got the homeowning bug and I went along — mainly because, even though renting had always been the norm, there was always lip service paid to the unalloyed good of property ownership. Since I would expect to move more often as a renter, I’d also want a more robust and economical network of storage and moving services than exists today; but in a successful transition to the rental-oriented new-urban utopia of tomorrow that should follow naturally. I can’t wait. Then one of the members hit on an interesting kind of quiz that the database could not help with: he sent sheet music snippets in e-mail and challenged us to identify which movie’s theme music it was! Brilliant. I came up with my own solution to the problem: finding connections among multiple movies involving descriptions of scenes or other unsearchable aspects that require you actually to have seen the films. For a while I challenged the team with one such question each week, and it was a popular feature while it lasted. I have since used the questions at parties, shared them with trivia buffs, and mailed them hither and yon, but never posted them here despite promises to do so; so here is the first one. The answer appears below. See if you can solve it without peeking! Believe it or not, there’s a top Hollywood actress who, in the space of two years, was in two otherwise unrelated major films in which her male costar’s lower jaw fell off! Who is she, and what are the films? In the second movie, this actress played newlywed to the actor in question; but in real life she was newly wed to the actor from the first movie! Geena Davis, in The Fly (where it’s Jeff Goldblum’s jaw that drops) and Beetlejuice (Alec Baldwin’s). My canned wrap-up to this question is: “What a weird connection, eh? Too bad the trend didn’t continue. It could’ve become her trademark, like ‘Ah’ll be back,’” to which Ken Jennings replied, “It definitely would have improved Stuart Little.” Several months after I originally created this question, I saw another film in which a character’s jaw falls off. But it was a minor character and I could find no other interesting connection to Geena Davis or these two movies. The movie was The Frighteners with Michael J. Fox (and the underappreciated Trini Alvarado). When I posed this question to the denizens of Ken Jennings’ site, one of them reported that it’s now easy to answer this one “from scratch” via Google. Oh well. I’ll post a hard one next. Here’s some unexpected good news: the Arbitration Fairness Act has been introduced in the U.S. House of Representatives. As I wrote last September, the mandatory binding arbitration clauses that are ubiquitous in the service contracts we sign are “as un-American a practice as I can imagine” because they deny you your day in court should you have a grievance. It’s a measure of how well the monied interests have us brainwashed that most of us think this is a good thing — there are too many frivolous lawsuits and too many lawyers getting rich, driving up the prices of everything, right? Wrong. That’s just what they want you to think. So most of us think mandatory binding arbitration clauses are no big deal, if we ever think about them at all, and hardly any of us do, even though we agree to them almost every time we enter a professional relationship with someone: a doctor, a landlord, an employer. Which is why it’s such a surprise to see opposition to this practice getting a little traction in Congress — in these days of global megacrisis piled atop global megacrisis, the phrase “mandatory binding arbitration” isn’t exactly spilling from everyone’s lips. So extra kudos to the sponsor of the bill, U.S. Representative Hank Johnson of Georgia’s fourth congressional district, for doing what’s right even when all the oxygen has been sucked out of the room. Let’s show him some love in the form of a token contribution to his campaign fund. Hi, it’s me! Pick up the phone, please! Hi, Mom! How are you? I’m OK. I have some exciting news for you. We finally used the sled! Yeah, the sled. You know — the Centennial Edition Flexible Flyer you once gave me. I gave you a sled? Yeah, don’t you remember? It was a really big deal. You used to keep asking me whether I had used it yet. Ohh, yeah, I remember. That was a long time ago! Yeah! Twenty years. You sent me that sled in Pittsburgh. Twenty years you didn’t use the sled? What can I say? We tried a few times but this was the first real opportunity we had. 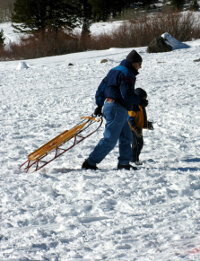 I can’t believe that in twenty years you never had a chance to use the sled. Well, keep in mind where I’ve been living for seventeen of those years. We got one millimeter of snow one day in seventeen years, and no one could believe it. So where did you use it? We took the kids to Tahoe. I wish you could have seen them. 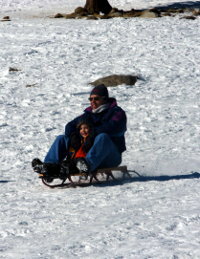 They loved the snow, and the sled works great! In fact it works a little too well — it goes fast, and it was a little scary! For you, or for the boys? Oh for me, definitely. The kids were fearless. I can’t picture you scared on a sled. “Centennial Edition Flexible Flyer” — that must be worth something by now. Yeah, probably. That’s part of the reason we’ve schlepped it around for twenty years. If you keep it in good condition, maybe you can sell it for some nice bucks when the boys grow up. Pshaw. I don’t want to worry about keeping it in good condition, I want to use it. It can’t possibly be worth more than the fun we have using it! That’s the right attitude. I want to see pictures.